Mr Tillman is a former Johnson and Johnson fellow in knee replacement at The Brigham and Women’s Hospital, USA. This is the hospital where the Kinemax, Kinematic and Press-Fit Condylar (PFC) knee replacements were developed, and so can claim to be the foremost centre for knee replacement in the world. Mr Tillman has lectured nationally on advanced knee replacement techniques, and receives referrals of problem knees from many colleagues, He has performed approximately 2000 primary and revision knee replacements and also regularly undertakes arthroscopic (keyhole) surgery for osteo-arthritis and cartilage problems. 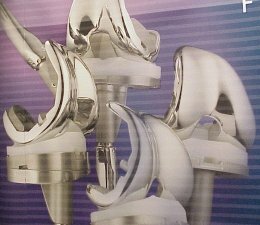 Total knee replacement is now a reliable and successful procedure with excellent 20 year results. Patients can be, in most cases, back on the golf course within weeks of surgery and the risk of complications such as infection (Mr Tillman has a zero percent infection rate for primary knee replacements) and Deep Vein Thrombosis is extremely low. In-patient stay is usually 4 – 5 days. Mr Tillman recommends, for both his NHS and private patients, the PFC total knee replacement which is the no 1 prosthesis in the USA and is widely considered to be the best on the market in terms of design, quality and performance. Some patients with very severe bone deformity may however require different implants. These options will be discussed and tailored to the individual patient.